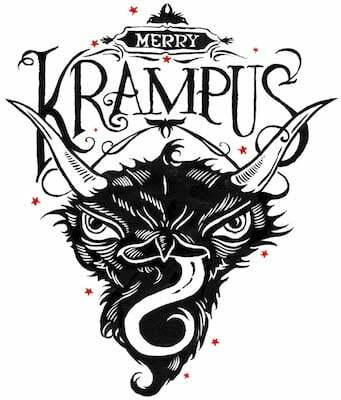 Back in November we announced the winning authors of ‘Krampus Crackers‘ – an innovative flash fiction project from Brisbane-based publisher Tiny Owl Workshop. Run in both Australia and the UK, Tiny Owl Workshop sought 12 short stories to be illustrated by artists (including Terry Whidborne, Simon Cottee, Kathleen Jennings and Gustavo Ortegar) before being made into Krampus Crackers – replacing our conventional Christmas cracker jokes with the winning flash fiction. 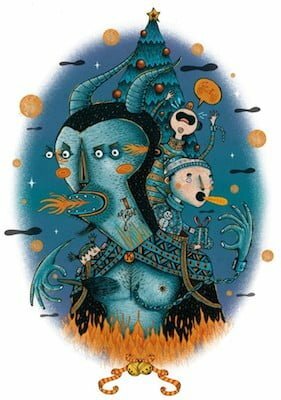 The short stories were all inspired by the mythical Christmas demon Krampus and we published a sneak peek into each winning author and their story here. The crackers are available to pick up in venues across Leeds including Mrs Atha’s, Outlaws Yacht Club, Heaven, Friends of Ham, Leeds North Bar, Sandinista…and many more. “Repellent?” Amber’s dad waits, his sharpened pencil hovering over the clipboard. “Check,” Amber says as she pulls the trigger of the plant spray. The shed now smells of cinnamon, cloves and a hint of pine. Her mum had sung Silent Night while pouring the mixture into the plastic bottle, her attempt at a blessing. “Check,” Amber replies as she places two blue pine tree branches, rubbed with goose fat, against the wall. Amber inspects the small lump of wax in the palm of her hand. She used to think that her life expectancy decreased every year on December 6th as the flame ate away at its fuel source. “Let’s hunt!” Her dad rolls up the checklist and puts it into the jam jar next to last year’s. There are twenty-two jars now. Faithful to tradition he hands Amber her bat; a gingerbread man carved out of wood. It used to be the size of her forearm but the gingerbread man didn’t keep up with the growth spurt of her bones and now it’s more like a fly swatter than a weapon. They open the shed door and balance on the step as the wind grabs a hold of the door and swings it open. The garden path is white, not with snow, but dusted with flour. Amber shields the remains of her candle as her dad, in one swift move, flicks the cover of his synthetic diamond-encrusted lighter and ignites it. Their footsteps in the all-purpose flour are quickly erased as they drag the branches behind them. A mixture of fear and excitement tickles the back of Amber’s throat. She looks over at their elm tree only a few metres removed from the gate. It has been reduced to a stump, robbed of its branches, with compliments of her dad. Not that he’d enjoyed it but everyone in the village had the same duty. “Look,” her dad whispers as he moves his oil lamp closer to the ground. There’s one footprint and the outline of a hoof. Amber taps her dad on the shoulder and points to a gap at the bottom of the fence where a lizard-like tongue covered in blisters lies unmoving like a stranded fish. The hinges of the gate shriek in protest as they edge it open. Next to the beast’s head are two empty salad bowls; licked clean of every last drop of walnut brandy. 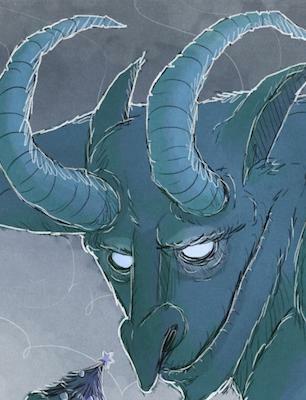 Amber gently touches the fur between his horns. The flame of her birth candle shrinks before transforming into a modest plume of smoke. Her dad has already started to pull a large sack made of steel wool over the intoxicated body. Afterwards, they light their goose-fat-soaked branches as a sign for the rest of the village that it’s safe for another year. “Until next Christmas, hairy old friend,” her dad whispers as he secures the shed door.